← Preparedness events this week! 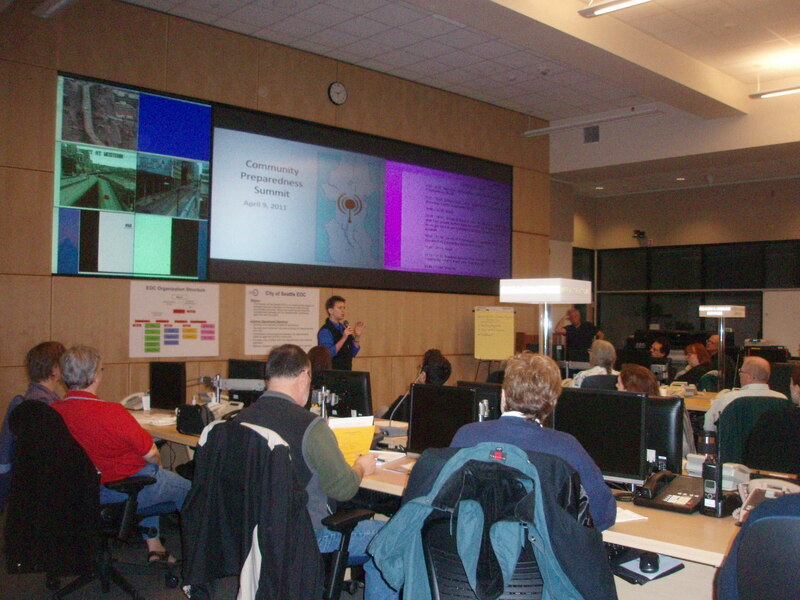 Over 50 attendees filled the Emergency Operations Center (EOC) at the Office of Emergency Management for a 3-hour Community Preparedness Summit on Saturday, April 9th. It was an information-packed event with participants from West Seattle and many different Seattle neighborhoods, plus a few others from further away: Vashon, Auburn, Woodinville and others. The Summit began with some opening remarks by Barb Graff, director of the OEM. She spoke of the importance of building relationships across neighborhoods and communities; reflected on the possibility of an earthquake or other disaster occurring in our area; and noted that the number of emergency responder teams currently in the city, 35 teams of firefighters, would be the same today as on the day of a disaster. Those resources will be spread very thin until additional responders are mobilized from elsewhere; she noted that “fortunately, there are tens of thousands of us” and we have the capacity to help each other. Mark Howard, Community Planning Coordinator, facilitated the event. He prefaced his introductory remarks with a slideshow of the recent earthquake-triggered devastation in Christchurch, New Zealand and Japan. Everyone watched in silence and the silence continued after it ended. He acknowledged that it was a ‘sobering slideshow’, but noted that these images are what made the news, and the most vivid images are repeated over and over. “A key takeaway”, he emphasized “is how important it is that we have something in place, following a disaster like one of these, to allow us to move forward”. Next up was Debbie Goetz, Office of Emergency Management Training Specialist for the SNAP program. She began her presentation with several short, funny preparedness videos that were designed to get people – especially young people – thinking. 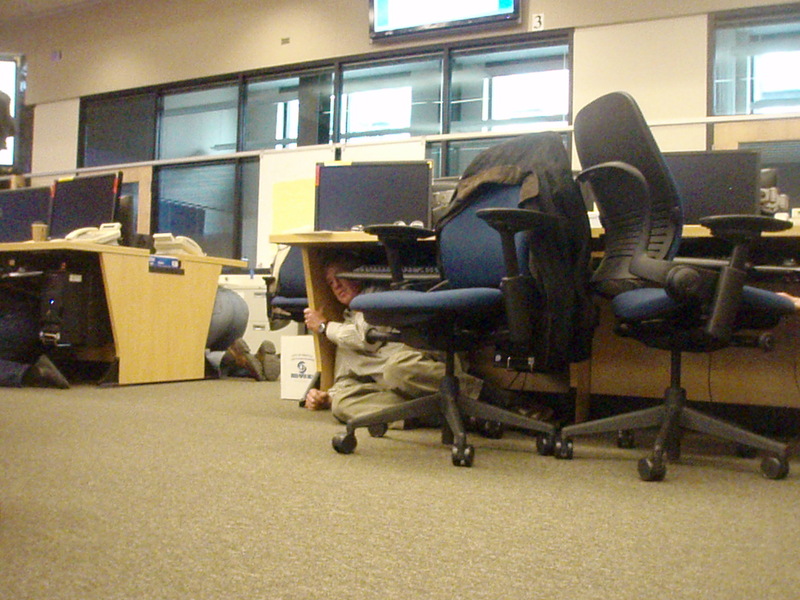 She noted that earthquakes are one of the most survivable disasters. She elaborated that there is both good news and bad news regarding earthquakes; the good news: “Chances are, you’re going to survive”; the bad news: “Chances are, you’re going to survive”…which is a key reason to prepare for what may follow. She then led in to an overview of how to prepare at a personal, family, household, and block level. Throughout the Summit, the concept of four different levels of preparedness was mentioned – illustrated as a Preparedness Pyramid diagram; her presentation described how to prepare at the first two levels. She emphasized taking steps to ensure that you and your household stay hydrated, warm, fed and dry. As well, it’s important to include items to satisfy your “quirks, comforts, connections” – for example, medications or photos. She also talked safety during an earthquake…surprisingly, participants suddenly found themselves on the floor to practice how to “Drop, Cover and Hold”. She reiterated the importance of finding safe places in your familiar everyday surroundings. In the event that there is no safe space to Drop, Cover and Hold; she recommended getting “Beneath, Beside or Between” so that you don’t get hit by falling objects or debris. 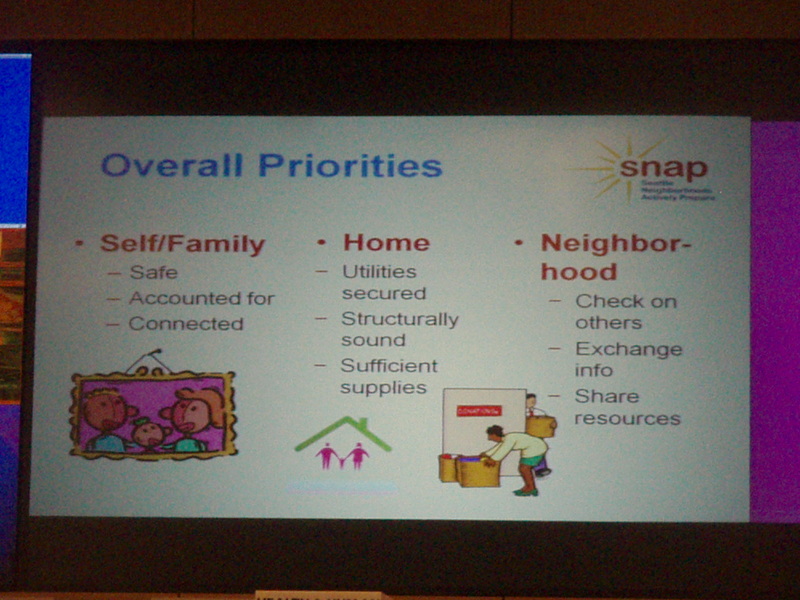 Goetz ended her session with some tips for making plans for your family/household and organizing with your neighbors. Her key points are: identify an out-of-area contact and be sure each person has that number written down (SNAP offers free out-of-area wallet cards); learn how to send text messages if you don’t already know how, as it’s more likely to go through when phone systems become overloaded; talk to your neighbors about implementing the “HELP/OK” signs (also available from SNAP) to let your neighbors know your status in an emergency; and lastly, find solutions and customize plans to fit your own neighborhood/community. The Community Preparedness Summit also included two sets of very lively small-group discussion sessions; these were geographical community breakouts so that attendees would have a chance to meet and interact with each other. The first session focused on what people have learned from the recent earthquakes and on how we can get more people in our communities involved. The second session focused on “Resiliency in the Community: what is it and what does it mean?”. We participated in both of the West Seattle sessions and will write more about those separately. 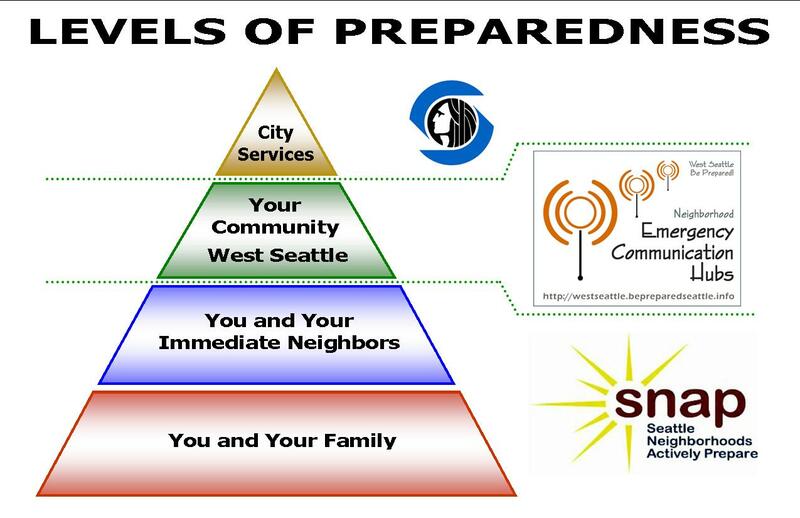 I’ll close with a reminder that on April 18th, West Seattle Be Prepared and the West Seattle Blockwatch Captains’ Network are co-sponsoring a SNAP prepareness training session with Debbie Goetz. Updated 4/21/11: Here are the highlights from the WS breakout sessions at the Community Preparedness Summit, on April 9th, 2011. Develop a CERT/SNAP daycamp that is scaled down for kids – this idea received the most interest & enthusiasm. How do you elevate our interest to aid the city in building resiliency? How can we get it to spread out? Can the fire department help do this? Local discussion & open house? Need to instill in people the principles of getting back up after a disaster & planning to help others. Mindset has to be shifted. If those of you reading this can think of additional items or suggestions, please send them our way! This entry was posted in Community Preparedness Summit, Earthquake Preparedness, Events and tagged Barb Graff, Community Preparedness Summit, Debbie Goetz, disaster preparedness, earthquake preparedness, Mark Howard, preparedness pyrmid, Seattle Office of Emergency Management, West Seattle emergency preparedness. Bookmark the permalink.